My relationship with beef has had its ups and downs. As a quasi-brooding adolescent, I tortured my parents with my vegetarianism until I arbitrarily decided to start eating meat again one day at age 14. At 16, my first paying job was selling Omaha Steaks, and I was fiercely loyal to red meat like a good Nebraska girl should be until I high-tailed it out of Omaha after high school. Since then, I've mostly been indifferent to steak. I'll enjoy a filet mignon at a fancy steakhouse about once a year, but otherwise it's fallen out of favor as my protein of choice. Since I started cooking regularly about 2 years ago, I've never managed to get it quite right. Until now. Jaden's recipes have never failed me, and this beef recipe with Chinese-inspired flavors made my night. I'm adding it into my rotation of go-to weeknight meals. 1. In a bowl, combine the ingredients for the marinade. Add beef, toss, and marinate for 10 minutes at room temperature. 2. Meanwhile, in a small bowl, combine ingredients for the stir-fry sauce. 3. In a wok or large saute pan, add 1 inch of water and bring to a boil. Add the broccoli and cover to steam for 3 minutes. Drain. 4. Discard the water in the pan and dry the pan thoroughly. Set the pan over high heat and, when hot, add the high-heat cooking oil and swirl to coat. Add the garlic and fry for 15-30 seconds, until fragrant. Add the steak, keeping them in one layer, and fry for 30 seconds. Flip them over and fry the other side until cooked through. 5. Pour in the stir-fry sauce and stir to combine. Simmer about 30 seconds. Add the broccoli back into the pan, along with the water chestnuts. Toss to coat well, and serve over jasmine rice. I'm glad you loved it! Jaden has such great recipes =D. I myself don't really eat red meat, not in a vegetarian way, I just don't particularly care for it. Happy Birthday to Wendy as well! Hope she has a fabulous day =D. 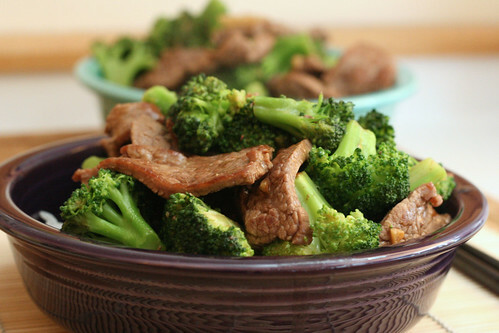 This beef and broccoli looks fabulous. I always have issues with overcooking the beef when I make something like this. She does have some great recipes. Yours looks delicious. Yum!! This sounds good anyway, but your picture makes it look even more delicious! I don't cook a lot of beef (let alone steak), but I'll have to try this one.